On Sunday December 6 from 4 to 6 pm, as part of the Approaching −273.15° C exhibition at academic in LIC , MTAA will perform the 2/1 section of Music4Music4Airports (M4M4A) . This section focuses on LGA in Queens. Along with MTAA’s M4M4A , the afternoon will have live works by C∆N-D, Lo Vid, and Raphaele Shirley. 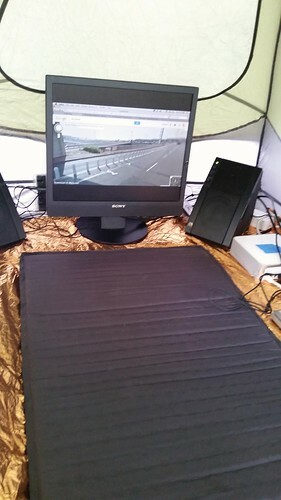 M4M4A was first show at #yaminyc 2015 at the Knockdown Center in a tent on a space blanket with audio run trough a guitar distortion pedal. Music4Music4Airports (M4M4A), 2015 from mriver on Vimeo. I would like to tell you, as much as I can, about a photograph. I will tell you almost everything I can discern from the exterior of the image across the perimeter towards a center. Everything I tell you may not be accurate but I will try my best. Absolute zero (−273.15° Celsius or 0°on the Kelvin scale) is the temperature at which all motion in matter stops. Until very recently this state of perfect stillness and corresponding order was thought to be unreachable. 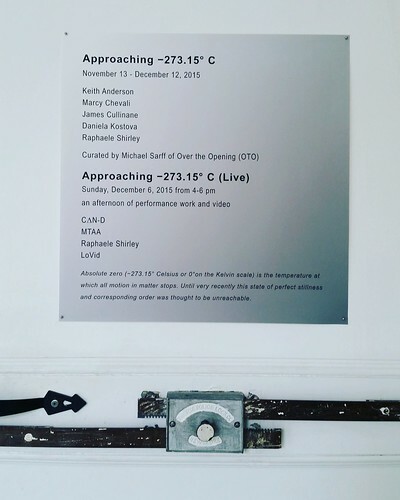 For the exhibition Approaching −273.15° C at academic from November 13 to December 12, 2015, Keith Anderson, Marcy Chevali, James Cullinane, Daniela Kostova and Raphaele Shirley create art in regions that move from active and chaotic towards an ever distant ideal of rest and symmetry. Contained within the metaphors and physicality of this approach, the artist point towards a space that operates just before a perfect cold. It is in this endless state of almost null, the artworks in Approaching −273.15° C float suspended between transformation and resolution. For the exhibition, Keith Anderson masks out the industrial windows of Academic’s gallery with a detailed installation using black archival tape. Paired against the window installation, titled For Nico, because………………. Anderson presents a sculpture titled In this Box from 2012. The work consists of a mid sized cardboard box displayed open at the top sitting on the floor. The cardboard is completely encased with paint mixed with dry pigment over asphalt saturated cotton fabric commonly used in roofing. 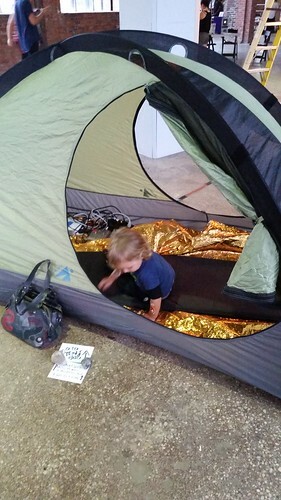 As the window installation uses the film of black tape to shutter light and space, the tar paper of the box works in an opposite track by defining a void. 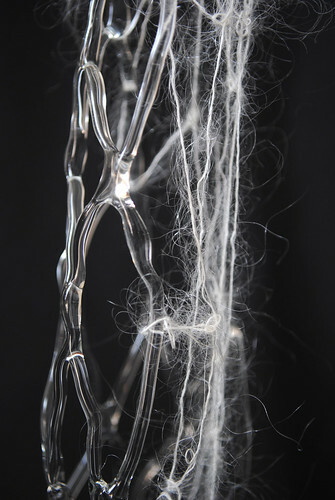 Marcy Chevali installs a group of ethereal nets pulled floor to ceiling. The nets, made of flameworked glass joined to stands of fiber, compress both inward and expand out against the room’s limits. This installation of nets, titled Cirrus, is accompanied by a set of photographs capturing actions performed by Chevali in the landscape of Mexico in 2014. In these actions, titled Circumference, Chevali kneels face down and outlines the space around her as far as her arms can reach. She then waits as wind and water erase the line. In both bodies of work, Chevali sets line and material in active adaption against a bounded space. In two ink on gesso works, Casement and Portal from 2015, James Cullinane fills a white ground with a methodical system of black lines and points. The resulting image, formed with an internal method of production, pushes at the edges of the doorway sized panels and fills the interior with a near universe of pattern and movement. As with Chevali work, verging edge conditions and the space between provide tension in movement and ideal. In her recent series of works, Daniela Kostova documents the raising of her daughter Vega. Kostova’s photographic images of Vega’s exploration, adventure and rest are then enlarged and outputted as PVC banners or wallpaper. These large scale skins are adhered to vernacular architecture in a way that brings the images into an active connection to a site. The work jumps from the intimate scale of home and learning to the public scope of industry and commerce. For Approaching −273.15° C, Kostova present images of Vega’s time with her babysitter who is the activist and model Rain Dove. A set of small gray metal arches are stacked on a black mirrored sheet in Raphaele Shirley’s artwork titled Cracked Arena, 2014. The arches, placed in descending size, are held cantilevered by gravity. The joined arches build two half domes around a darkened center. Echoing this stepped dome structure, a second work, Untitled, 2015 is built of concentric wood rings. The rings expand in diameter outward to build a shallow bowl shape. As the metal arches of Cracked Arena weigh downwards to enclose a space in shadow, the rings of wood inversely are propelled off the white wall by a circle of neon light. This light is amplified by the reflection from the surface of gold leaf partially concealed behind the wood surface. Light, both in absence and abundance, pushes against the ripple-like solid structures of the two works. 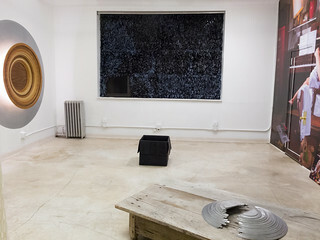 About Over The Opening (OTO) - In the fall of 2007, the artist collaboration MTAA (Michael Sarff and Tim Whidden) began to invite artists and art collectives to present one-night exhibitions of time based art in their Brooklyn, New York studio. The monthly event titled Over The Opening (OTO) operated as a blurring of studio space, exhibition venue and curatorial experiment. OTO presented a diverse range of art practices including endurance performance, net art, participatory events, conceptual lectures, as well as painting, installation and sculpture. In December 2009, after 24 exhibitions, OTO morphed from monthly one night event to a nomadic curatorial umbrella. 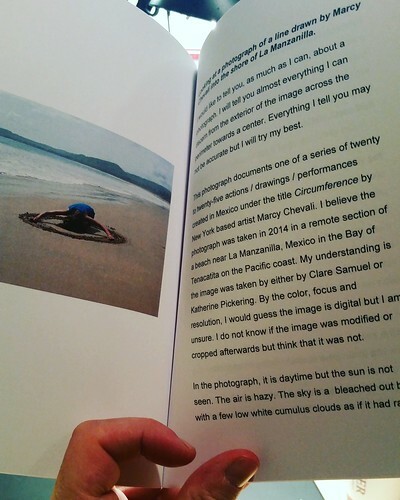 Marcy Chevali’s project, Cirrus, is made possible in part by the Queens Council on the Arts with public funds from the New York City Department of Cultural Affairs in partnership with the City Council. Additional support provided by Urban Glass.